This Wall Street Journal article on the collaboration between reclusive Swiss architect Peter Zumthor and ascetic Dutch landscaper Piet Oudolf made me think about my own (much less famous) interaction with A.Y. 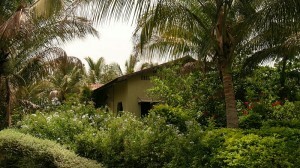 Retiwalla for the Karjat Resort a decade ago. Unlike the collaborators here, neither of us had heard of the other before and were brought together by the client, Dr. Beramji. Still, the mutual respect and acceptance of ideas was similar and it ultimately led to something that was appreciated by all. Mr. Retiwalla was already well established in his line and it is to his credit that he discussed things with a relative youngster like myself, purely on merit. Ideas flowed freely between us and, with Dr. Beramji taking a keen interest in every aspect of the project, the tripartite meetings were very enjoyable. As Queen’s 1980s song, Radio Ga Ga, laments, “we hardly need to use our ears“. Actually, we abuse our ears or, at the very least, ignore the abuse that others heap upon them. Unfortunately, while we are easily able to close our eyes, nature hasn’t equipped us with lids to effectively shut our ears. But what does architecture and design have to do with all this? Usually, unless an architect is designing something with an overt acoustic requirement like, say, an auditorium or a recording studio, only visual aesthetics are considered. However, as Julian Treasure points out in this TED talk, the auditory aspect is more crucial than we realise. He illustrates just how detrimental the effects of noise can be, not only in special environments like hospitals or schools, but in homes and offices as well. For myself–even though I’m quite aware of the debilitating effects of loud noise–the talk was quite an eye-opener. For the MChi interior site in Bombay (Mumbai), I found some really nice LED light fittings but they are more than three times the cost of identical CFL fittings. Now we all know that LEDs consume very little electricity and they have an extremely long life but I wanted hard numbers to convince my clients – after all, they are the ones paying for everything. It didn’t take long… At the light shop, it was pretty obvious that the 18W LED fitting threw as much light as an identical one housing 36W of CFLs. Frankly I was a little surprised by the 1:2 power consumption ratio because I always assumed it was more like 2:3. However, LED technology is making such rapid strides that yesterday’s facts are already redundant. Putting all the costs into a spreadsheet immediately produced a very compelling argument in favour of the former. 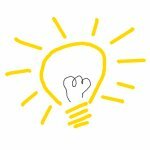 While the life of an LED bulb is in the region of 50,000 hours, the calculation over such a long period (while in favour of LEDs) is rather unfair because even at 5 hours per day, that means 27 years. Instead, I’m working with 30,000 hours which represents a more realistic 16 years. 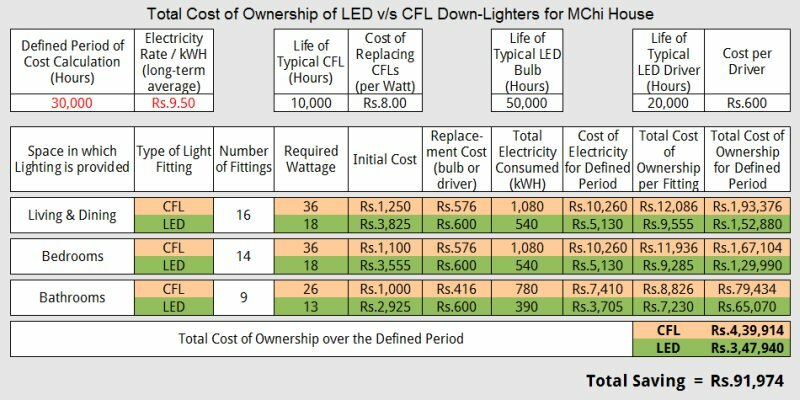 Even accounting for the fact that the LED driver (an electronic device that regulates the power that LEDs receive) doesn’t have a 50,000 hour life, the calculation still showed a huge saving. 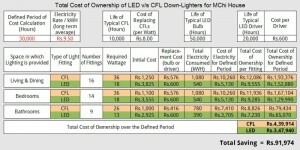 The calculations here are not likely to remain valid for long because the cost of power is sure to rise even further and that of LEDs can only go downwards. And here are some images of what the house is going to look like when complete. Last week ended with a site visit to Nasrapur, Karjat. This is the fourth design in the same general location after the [RaBV], [BAli] and [LGEs] bungalows so I’m extremely familiar with the area and climate. 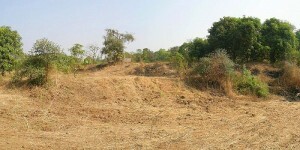 Part of this particular one-acre plot is prone to flooding during the monsoon, and the only portion that is safely outside the flood zone (even considering the massive downpour of 26th July 2005) is on a mound near the road. On this rise stands the ruin of an old shed which I had seen earlier but was unable to explore properly because, until recently, it was overgrown with Mucuna pruriens — locally known as khaj khujri. This climbing shrub causes extreme itching on contact with young foliage or seed pods and I wasn’t about to take my chances. Unlike other plots in this cooperative society, this particular site doesn’t have too many mango trees — mostly due to the flooding aspect. We intend to plant native trees such as Millettia pinnata or karanj which thrive in such conditions. I am really looking forward to starting the design. Conceptually, I’m looking at a string of structures — some of them without walls — forming a sort of “C” shape around a water body. The river, unfortunately, is too far away and not visible from the mound. The mountains of Matheran and the Garbat plateau, though, give a splendid view to the West. For most projects, I not only design, but also execute the work. For this one, though, because of distance, I only did the former. 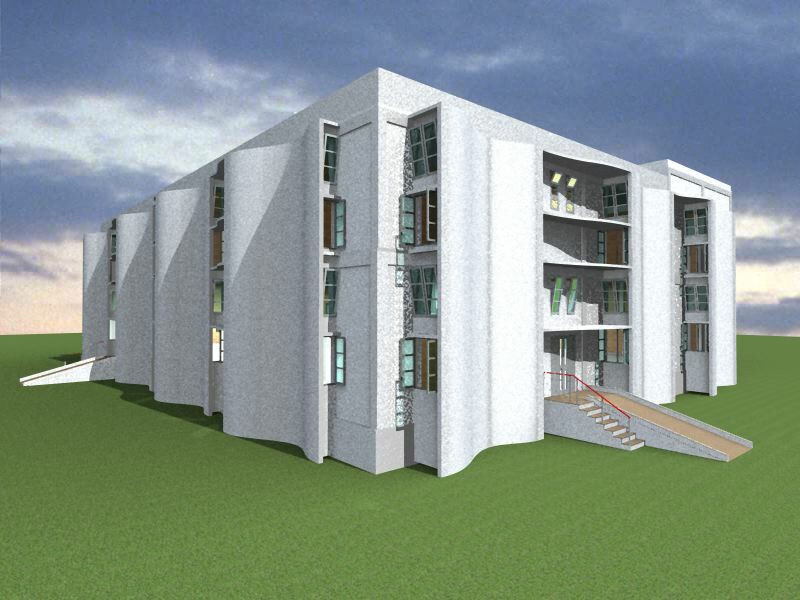 The clients, manufacturers of packaging material in Cuttack, Orissa, wanted to construct a factory that was not just functional but, to the greatest extent possible, a green building in all respects. The product they make is hardly environmentally friendly, so it was somewhat ironic, but they had a genuine desire to make a change for the better so I agreed to take the assignment. Initially, the structure was to be of a single story only so, had that remained the case, the factory might just have looked like a variation on a theme with north-light roof trusses and curved metal roofs instead of straight ones. Instead, and as luck would have it, the clients decided that they needed at least one additional floor to house the lighter machinery. Land in this area–alongside the Mahanadi river–is expensive and it would do them no good to scatter multiple structures all over the 2 acre plot. That posed a problem for the design as the clerestory windows would be of no use to the lower floor — either for light or ventilation. North West corner of the factory. 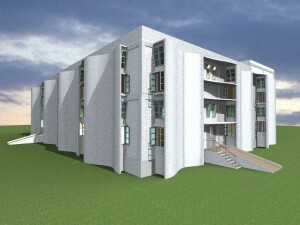 This was the final design based on which the factory was actually built. You will notice that windows facing North are twice as large as those pointing West. 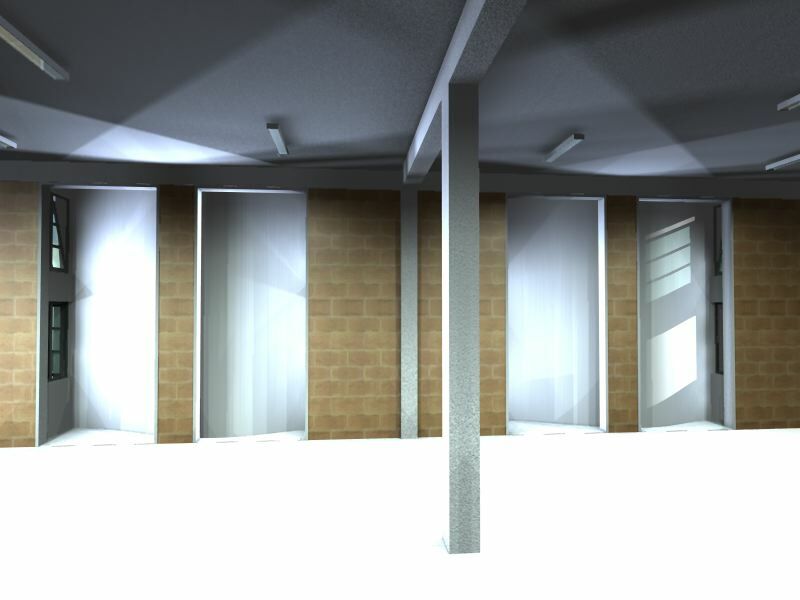 So, to allow for the clerestory windows to be used by both floors, I thought to turn them sideways. Back at the drawing board, I realised that only allowing windows on the North and East would mean the interiors of the factory would be dark for much of the day — not to mention that natural ventilation would be nil. 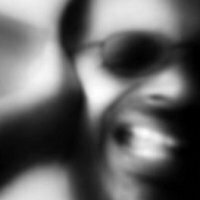 On the other hand, too much light from the South or West was not desirable and neither was a draft that could carry in dust particles. So I reverted to an undulating form–a double wave form in fact–that not only softens the factory outline but also works better for ventilation. Here the smaller waves face the South and West and the bigger ones face the North and East. Now, when light enters, it reflects off the inner side of the baffle walls. Any heat that is generated remains in the immediate vicinity of the windows. Additionally, the upper of the two windows is bottom-hung to allow hot air to easily escape. 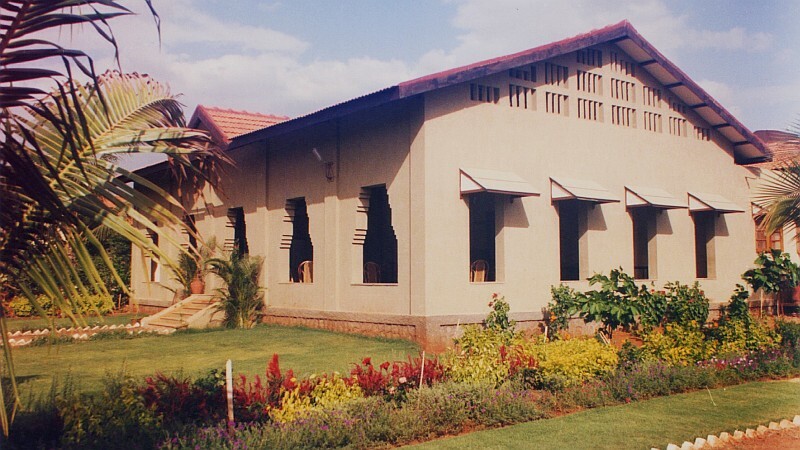 Between successive waves in the baffle walls, horizontal awnings protect the more conventional windows from the sun during the hottest times of the day. In fact, sun-studies were carried out to ensure that the sun’s rays almost never directly reach the building’s interiors between 10:00am & 3:00pm. 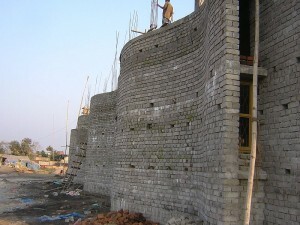 A view of the factory under construction shows the flyash bricks used for the walls. Being a large structure which needs to take heavy loading, the framework and slabs had necessarily to be in RCC — a material that I avoid using when it is not required. 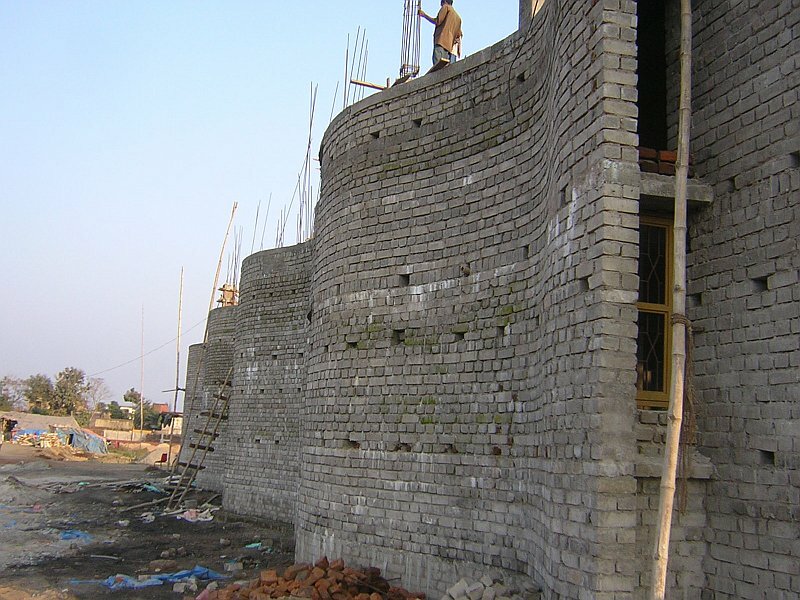 All the walls, including those of the baffles were from flyash brick and plastered only where necessary. Initially, we wanted to use the local laterite but that worked out much too expensive. There are a number of things you can do to attract butterflies and birds to your garden. Here is a basic list that may be useful as a starting point for people living in peninsular India. Please remember that this list is neither complete nor comprehensive because habitats vary so dramatically across our country. I’ve tried as far as possible to list local species but some, like the Lantana, have naturalised in our country and have therefore found a mention. A number of butterfly species lay their eggs on grasses – but not of the cultivated kind. Unless you have a very large plot, it is unlikely you’d want to allow these to grow. However, if the possibility exists, it is nice to let a patch of garden in a corner somewhere actually grow wild. Bamboos are food for some butterfly species and refuge for many birds and other creatures. Keep them a little distant from your house if you’re petrified of snakes, though. Even if you live in the heart of a city like Mumbai, you will be surprised by the variety of birds you can see if there is enough greenery around. I’ve seen the beautiful Paradise Flycatcher in Breach Candy which is, barring a couple of tiny green pockets, as concrete a jungle as you can get. Although the links above all point to wikipedia, a very good resource I have found for Indian plants is Flowers of India. The site aims at having comprehensive information about Indian flowering plants with their common names (especially in Indian languages), pictures and details of habitat and distribution. Erosion of soil is a very real problem that can crop up when we encounter sloping land on a site. In this article, I’ll outline the measures taken on two different sites where erosion needed to be controlled. The first was done entirely via plantation and the second (where the foundation of a building had to be supported) involved terracing of the land — in conjunction with plantation of course. In the year 2003, a client of mine wanted to buy an 11 acre plot of land along the Narmada river. It was a lovely location but the soil was very soft and powdery and the land was scarred by deep fissures where rainwater flowed down to the main river. What made it downright dangerous was that these steep gullies were collapsing at points and something needed to be done before parts of the plot got cut off and became inaccessible. At the time, I suggested reducing the angle of the slopes and planting local reeds that grew along the riverfront to hold the soil. The first part worked but the second did not. The wild plants refused to grow where we wanted them to and something else needed to be found. That’s when she decided to try growing Chrysopogon zizanioides — Vetiver (also called Khus). What happened next was almost miraculous. The Vetiver took hold of the soil and bound it in a way that not only stopped erosion but allowed rainwater to seep into the soil instead of letting it all run off to the river. As a result, even the trees growing in the gullies got healthier and what looked like an almost barren landscape then, is now a great example of how working with mother nature is far more productive than trying to fight her. And plantation costs a fraction of what it would if we used “man-made” solutions. What makes Vetiver different from other grasses is the fact that it’s roots do not form a horizontal mat like the others but grow downwards as far as 4m (13 feet). Another good thing is that it propagates in a way that makes it easy to control – so it doesn’t become an invasive weed. To know more about Vetiver and how to use it for erosion control, go to the Vetiver International Network Website and download their manuals, videos and presentations. Now, while I’ve been extolling the benefits of natural solutions, there are times when we simply have to use brick and mortar solutions when structural demands have to be met. The [RaBV] bungalow at Nasrapur was built on steeply sloping land and we not only had to prevent erosion but also make sure that the building’s foundations had rock solid support even if an earthquake struck. In such a situation, simply planting Vetiver, or any other vegetation for that matter, would never have been sufficient. 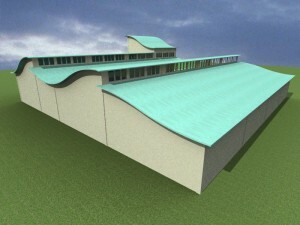 The first thing to do in the design was to follow the slope of the land as closely as possible. The main floor level was split with the living room sunk by about 0.6m (2 feet) from the rest of the house. Then, the verandah which projected by 2.4m (8 feet) beyond the house line was almost 1.8m (6 feet) above surrounding ground level so instead of filling it up, a little earth was excavated and an extra level – like a basement – was created below the verandah. Not only did this reduce loading on the peripheral foundation wall in a big way but is also served as a space for garden implements, a separate room for rainwater harvesting tanks and parking for a motorcycle. The verandah effectively then, became the first terrace. 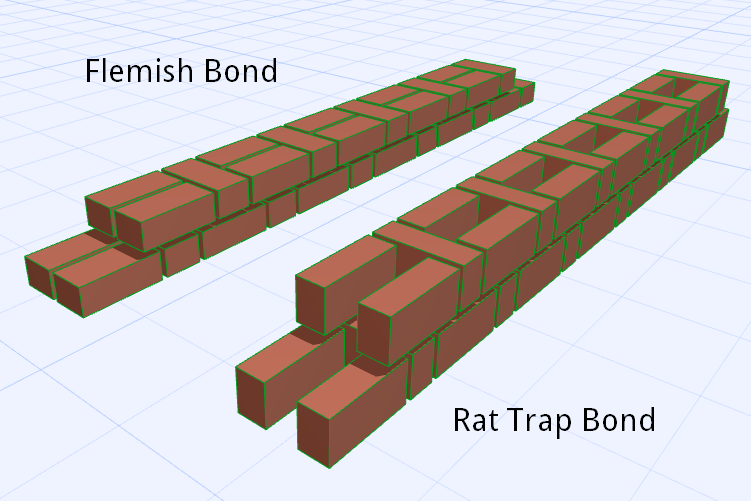 Then, to buttress the foundation, a second terrace was created just in front of the basement. Here, we planted only shrubs and bushes – nothing with strong roots that might weaken the stone wall at some future date. Finally, we built a retaining wall to support the second terrace. Maybe it was unnecessary to go so far but, when there is going to be no second chance to correct a mistake, you tend to err on the side of caution. Around the bungalow, on non-critical slopes, local vegetation has been allowed to grow naturally and has taken root well enough to protect against erosion. The lives of birds and insects are so closely intertwined that you’re unlikely to have one without the other and both are extremely dependent on plants for shelter and sustenance. In nature, nothing works in isolation so, if you want to attract what are generally considered “beautiful creatures” to your garden, you have to be willing to accept the less popular ones. If you want butterflies, you will also have caterpillars and if you want birds you have to be willing to accept all manner of insects – some of which will attack your plants. Despite that, it is extremely important to avoid chemical pesticides and fertilisers that will either kill them or drive them away. Unlike plants that are able to selectively repel certain types of creatures, man-made chemicals are less discriminating. Instead, if you want to keep the caterpillars (and other plant-eating insects) in check, make sure your garden also attracts birds. Butterflies and their caterpillars are themselves food for many birds and if the garden isn’t attractive to birds, the caterpillars will eat everything in sight. It’s just part of the balance of nature. This page gives a list of trees and shrubs that you could plant to attract both, birds and butterflies. I have not given separate lists because the two of them pretty much sail and sink together. Creating a garden that consistently attracts butterflies is not all that difficult. You don’t necessarily need a lot of space – although that naturally helps – but you will need to learn a bit about these beautiful creatures before you begin. What this page will give you, is only a primer to start you off because the species of butterflies found in different parts of our country vary quite dramatically. The first thing you need to provide if you want to attract these beautiful creatures to your garden, is a habitat they can be comfortable with. This means planting everything from dense shrubs that shelter them from predators and rain to tall trees (which some of the larger butterflies frequent in an activity known as “tree-topping”) while also leaving open space for them to bask close to the ground. Being cold-blooded insects, they need to warm their wings in the sun before they can take flight in the morning. The second thing you need to do is bribe them outright! Many (though by no means all) adult butterflies feed on the nectar of flowers. In doing so, they act as couriers for the pollen grains that stick to their bodies, thereby helping in pollination making it a symbiotic relationship. By and large, butterflies prefer to visit multiple small florets as opposed to single large flowers so you might want to look for plants that have these characteristics. It is helpful to have a variety of plants so that their different flowering seasons ensure availability of nectar through the year. The third important thing that most people don’t realise is that it is not enough to merely attract the adults; if you want their continued presence, you must provide for their young as well. Caterpillars (and here’s something you might not know) are very specific about the plant they feed on. Caterpillars of any given butterfly species will only feed on a single plant species or sometimes a bunch of related plant species. For instance, many of the smaller lycanid caterpillars will only feed on grasses while, say, a tiger butterfly will hunt for a certain milkweed (Calotropis) on which to lay her eggs – and a Red Pierrot caterpillar will restrict itself to the fleshy leaf of Bryophyllum. Put the red pierrot caterpillar on a tree full of juicy green leaves and it will simply die of starvation. One more thing that is easily provided and will attract a lot of male butterflies during the dry months is a patch of damp earth. Males flock to such patches for “mud-puddling” wherein they get salts and other nutrients from the soil which they need to be considered eligible by the females. And if you really start getting addicted to butterflies, you can also bait some species with rotten and fermenting fruit; the little alcoholics will simply love you! Like butterflies, birds also require a variety of plant types to make them visit your garden. Some birds like thrushes and babblers prefer to forage in the shade, Sunbirds go to nectar-rich flowers while parakeets and Barbets want to get at fruits and seeds that are usually found in the larger trees like the fig. One therefore needs to plant a tiered garden with patches of sunlight on the one hand and dense shade on the other. Also, birds usually prefer local vegetation so keep that in mind when you do your plantation. Install a bird-bath. It’s not very difficult to make and as long as you don’t have cats as pets (or neighbours), the birds will give you hours of enjoyment. There are numerous pages on the internet that explain how to make a birdbath. Just one thing to remember is that if you leave the water stagnant, you will be breeding mosquitoes – not a pleasant thing. The trees you plant should be dense and shade-giving. These will give great shelter for roosting or even nesting. And if they happen to be fruit-bearing, that is even better. Bushes, especially flowering ones, should be planted around the trees in clusters instead of scattered all over the place. As with any nature-friendly place, you should avoid (or at least minimise) the use of chemical fertilisers and pesticides. Pesticides will eliminate a broad range of insects and spiders some of which you may not be very keen on but which are extremely attractive to our feathered friends. A garden devoid of insects will get very few birds visiting especially during the nesting season when they’re foraging for their young. Nothing exists in isolation in nature and if you want to look at pretty creatures, you’ll have to learn to look at and enjoy the ones that aren’t as popular. There is a raging debate among naturalists about the desirability of cultivating exotic plant species and there are no easy answers. My own view is that we should try our best to avoid introducing any new species into an existing ecosystem but there is no need to get worked into a froth if a species has naturalised over a substantial period of time. Yes, there are places where exotic species have become very invasive at the cost of the local varieties and there may be a case for culling them – but such a discussion is beyond the scope of this article. Instead, we are going to focus on the use of exotic and native species in the context of what is appropriate landscape architecture in a predominantly hot country like India. Trees are often the first line of defence when it comes to passive cooling of a bungalow or other low-rise structure. They provide shade which prevents the build-up of heat not only on the ground but also on the walls of the building. Shade on the ground means the breeze coming in through your window is cooler and shade on the walls means less heat gets transferred indoors. Aside from shading, trees also cool by transpiration to the extent that they can, if properly located, reduce ambient temperatures by as much as 5° compared to the surroundings. So what kind of trees should we plant, and where? While the finer details vary across different parts of the country, broadly it is safe to say that the hottest sides are the South and West so, if you can concentrate on protecting these directions with dense evergreens, you’re good to go. On the East, you might want to have high-branching trees that won’t block your early morning sun and on the North – depending on whether you get direct sunlight penetration or not – you could grow colourful, possibly deciduous trees. You have to be careful during plantation that you leave enough distance between the tree and your foundation because many of the large trees have strong spreading roots. Trees, even in urban areas (albeit to a lesser extent), are part of an ecosystem and need to treated at as such. If they are native, they will invariably be well integrated into that ecosystem along with the local fauna like the birds and butterflies. An introduced plant is unlikely to be so well assimilated and may therefore not contribute in a positive way. There are plants that have been naturalised over a long period of time but I’m referring to those that have been introduced because they are ornamental or because they grow rapidly. Usually the ornamental ones are fragile and drop their branches on your head at the beginning of the monsoon and the fast-growing varieties with their short life-spans often sap the soil so severely that nothing else grows there for years after they’re gone. This is a very important factor to take into consideration especially if you’re thinking of sustainable landscaping. Many ornamental trees and bushes are extremely high-maintenance and don’t even get me started on lawns. They may look very pleasing to the eye but, with few exceptions, they guzzle frightening amounts of water and are often heavily sprayed with chemical pesticides — which naturally leech into the groundwater. Here, a very important argument for using native species is that they will, by default, survive with the naturally available moisture and precipitation. Of course they may need some amount of watering when they are saplings as also during the hot summer months but, in general, their water requirements are a small when compared to exotic ornamentals. Every single material used in construction comes, eventually, from the earth. For any architect who cares about nature, this is a dilemma to be faced every day.